The BodyContainer holds Body objects in the simulation; it is accessible as O.bodies. Body objects are only rarely constructed by hand by their components (Shape, Bound, State, Material); instead, convenience functions sphere, facet and wall are used to create them. Using these functions also ensures better future compatibility, if internals of Body change in some way. These functions receive geometry of the particle and several other characteristics. See their documentation for details. If the same Material is used for several (or many) bodies, it can be shared by adding it in O.materials, as explained below. The O.materials object (instance of Omega.materials) holds defined shared materials for bodies. It only supports addition, and will typically hold only a few instances (though there is no limit). label given to each material is optional, but can be passed to sphere and other functions for constructing body. The value returned by O.materials.append is an id of the material, which can be also passed to sphere – it is a little bit faster than using label, though not noticeable for small number of particles and perhaps less convenient. If no Material is specified when calling sphere, the last defined material is used; that is a convenient default. If no material is defined yet (hence there is no last material), a default material will be created: FrictMat(density=2e3,young=30e9,poisson=.3,frictionAngle=.5236). This should not happen for serious simulations, but is handy in simple scripts, where exact material properties are more or less irrelevant. As those functions use sphere and facet internally, they accept additional arguments passed to those functions. In particular, material for each body is selected following the rules above (last one if not specified, by label, by index, etc.). In some cases, you might want to create rigid aggregate of individual particles (i.e. particles will retain their mutual position during simulation). This we call a clump. 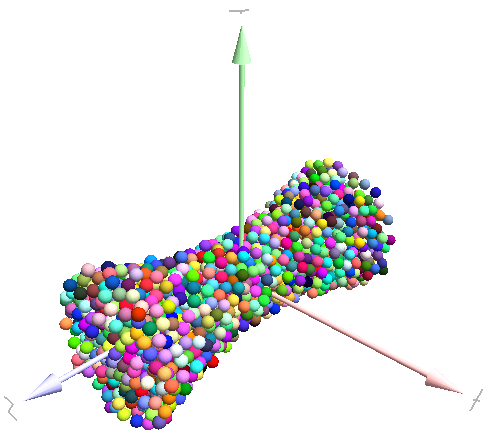 A clump is internally represented by a special body, referenced by clumpId of its members (see also isClump, isClumpMember and isStandalone). Like every body a clump has a position, which is the (mass) balance point between all members. A clump body itself has no interactions with other bodies. Interactions between clumps is represented by interactions between clump members. There are no interactions between clump members of the same clump. Another option is to replace standalone spheres from a given packing (see SpherePack and makeCloud) by clumps using clump templates. This is done by a function called replaceByClumps(). This function takes a list of clumpTemplates() and a list of amounts and replaces spheres by clumps. The volume of a new clump will be the same as the volume of the sphere, that was replaced (clump volume/mass/inertia is accounting for overlaps assuming that there are only pair overlaps). It is also possible to add bodies to a clump and release bodies from a clump. Also you can erase the clump (clump members will become standalone). Additionally YADE allows to achieve the roundness of a clump or roundness coefficient of a packing. Parts of the packing can be excluded from roundness measurement via exclude list. Have a look at examples/clumps/ folder. There you will find some examples, that show usage of different functions for clumps. Representing a solid of an arbitrary shape by arrangement of spheres presents the problem of sphere packing, i.e. spatial arrangement of spheres such that a given solid is approximately filled with them. For the purposes of DEM simulation, there can be several requirements. 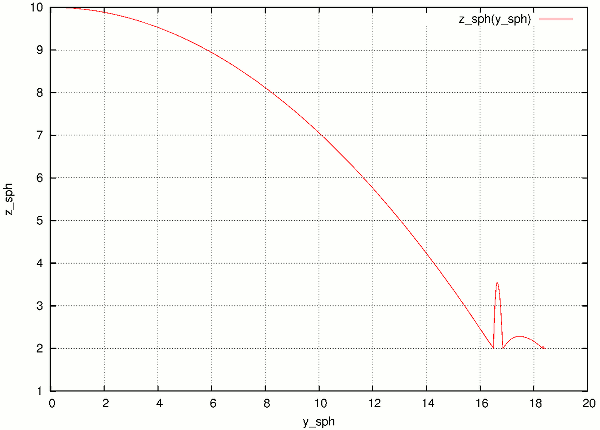 Distribution of spheres’ radii. Arbitrary volume can be filled completely with spheres provided there are no restrictions on their radius; in such case, number of spheres can be infinite and their radii approach zero. Since both number of particles and minimum sphere radius (via critical timestep) determine computation cost, radius distribution has to be given mandatorily. The most typical distribution is uniform: mean±dispersion; if dispersion is zero, all spheres will have the same radius. Smooth boundary. Some algorithms treat boundaries in such way that spheres are aligned on them, making them smoother as surface. Packing density, or the ratio of spheres volume and solid size. It is closely related to radius distribution. Coordination number, (average) number of contacts per sphere. Isotropy (related to regularity/irregularity); packings with preferred directions are usually not desirable, unless the modeled solid also has such preference. 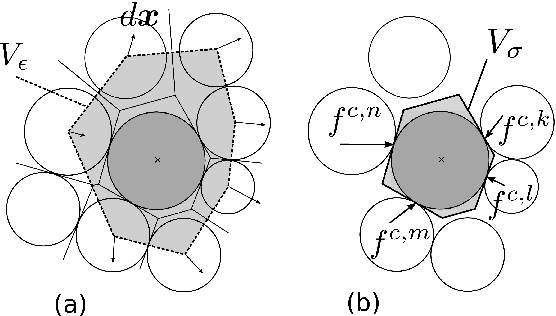 Permissible Spheres’ overlap; some algorithms might create packing where spheres slightly overlap; since overlap usually causes forces in DEM, overlap-free packings are sometimes called “stress-free‟. can decide whether given point is inside or outside the solid; most predicates can also (exactly or approximately) tell whether the point is inside and satisfies some given padding distance from the represented solid boundary (so that sphere of that volume doesn’t stick out of the solid). CSG approach describes volume by geometric primitives or primitive solids (sphere, cylinder, box, cone, …) and boolean operations on them. Primitives defined in Yade include inCylinder, inSphere, inEllipsoid, inHyperboloid, notInNotch. Specimen constructed with the pack.inHyperboloid predicate, packed with pack.randomDensePack. 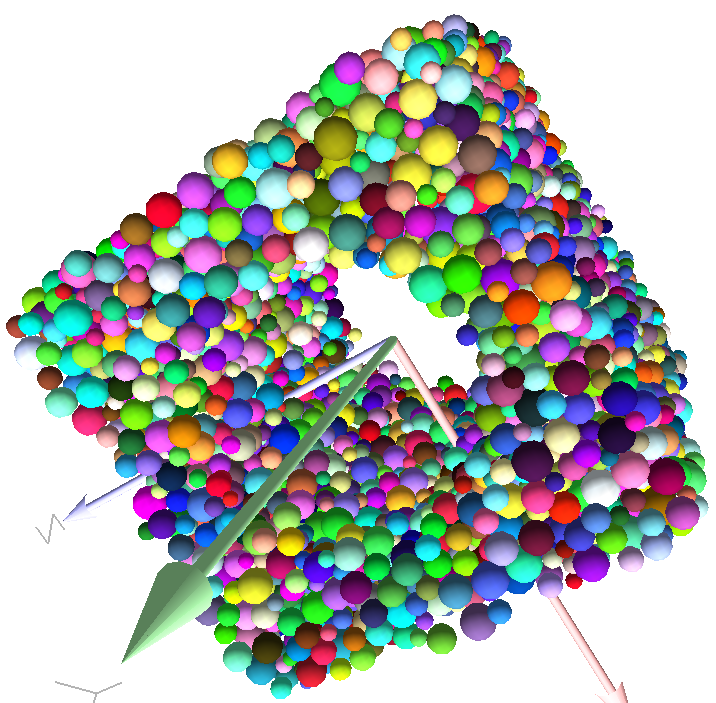 Representing a solid by its boundary is much more flexible than CSG volumes, but is mostly only approximate. Yade interfaces to GNU Triangulated Surface Library (GTS) to import surfaces readable by GTS, but also to construct them explicitly from within simulation scripts. This makes possible parametric construction of rather complicated shapes; there are functions to create set of 3d polylines from 2d polyline (pack.revolutionSurfaceMeridians), to triangulate surface between such set of 3d polylines (pack.sweptPolylines2gtsSurface). Triangulated funnel, constructed with the examples/funnel.py script. pack.inGtsSurface predicate can be created, using the surface as boundary representation of the enclosed volume. 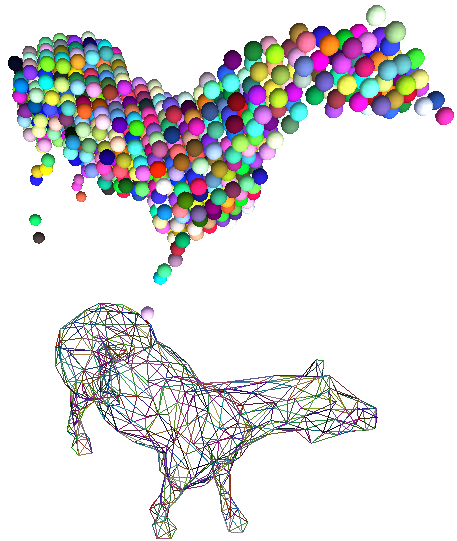 Imported GTS surface (horse) used as packing predicate (top) and surface constructed from facets (bottom). See http://www.youtube.com/watch?v=PZVruIlUX1A for movie of this simulation. intersection A & B (conjunction): point must be in both predicates involved. union A | B (disjunction): point must be in the first or in the second predicate. difference A - B (conjunction with second predicate negated): the point must be in the first predicate and not in the second one. symmetric difference A ^ B (exclusive disjunction): point must be in exactly one of the two predicates. Box with cylinder removed from inside, using difference of these two predicates. sphere is called for each position and radius computed; it receives extra keyword arguments of the packing function (i.e. arguments that the packing function doesn’t specify in its definition; they are noted **kw). Each sphere call creates actual Body objects with Sphere shape. List of Body objects is returned. List returned from the packing function can be added to simulation using toSimulation(). Legacy code used a call to O.bodies.append. their chief disadvantage is that radius distribution cannot be prescribed exactly, save in specific cases (regular packings); sphere radii are given by the algorithm, which already makes the system determined. If exact radius distribution is important for your problem, consider dynamic algorithms instead. Yade defines packing generators for spheres with constant radii, which can be used with volume predicates as described above. They are dense orthogonal packing (pack.regularOrtho) and dense hexagonal packing (pack.regularHexa). The latter creates so-called “hexagonal close packing”, which achieves maximum density (http://en.wikipedia.org/wiki/Close-packing_of_spheres). Clear disadvantage of regular packings is that they have very strong directional preferences, which might not be an issue in some cases. Random geometric algorithms do not integrate at all with volume predicates described above; rather, they take their own boundary/volume definition, which is used during sphere positioning. On the other hand, this makes it possible for them to respect boundary in the sense of making spheres touch it at appropriate places, rather than leaving empty space in-between. is library (python module) for packing generation developed with ESyS-Particle. It creates packing by random insertion of spheres with given radius range. Inserted spheres touch each other exactly and, more importantly, they also touch the boundary, if in its neighbourhood. Boundary is represented as special object of the GenGeo library (Sphere, cylinder, box, convex polyhedron, …). Therefore, GenGeo cannot be used with volume represented by yade predicates as explained above. Packings generated by this module can be imported directly via ymport.gengeo, or from saved file via ymport.gengeoFile. There is an example script examples/test/genCylLSM.py. Full documentation for GenGeo can be found at ESyS documentation website. There are debian packages esys-particle and python-demgengeo. The most versatile algorithm for random dense packing is provided by pack.randomDensePack. Initial loose packing of non-overlapping spheres is generated by randomly placing them in cuboid volume, with radii given by requested (currently only uniform) radius distribution. When no more spheres can be inserted, the packing is compressed and then uncompressed (see py/pack/pack.py for exact values of these “stresses”) by running a DEM simulation; Omega.switchScene is used to not affect existing simulation). Finally, resulting packing is clipped using provided predicate, as explained above. If number of spheres using the spheresInCell parameter is specified, only smaller specimen with periodic boundary is created and then repeated as to fill the predicate. This can provide high-quality packing with low regularity, depending on the spheresInCell parameter (value of several thousands is recommended). Providing memoizeDb parameter will make pack.randomDensePack first look into provided file (SQLite database) for packings with similar parameters. On success, the packing is simply read from database and returned. If there is no similar pre-existent packing, normal procedure is run, and the result is saved in the database before being returned, so that subsequent calls with same parameters will return quickly. If you need to obtain full periodic packing (rather than packing clipped by predicate), you can use pack.randomPeriPack. In case of specific needs, you can create packing yourself, “by hand”. For instance, packing boundary can be constructed from facets, letting randomly positioned spheres in space fall down under gravity. Yade integrates with the the GNU Triangulated Surface library, exposed in python via GTS module. GTS provides variety of functions for surface manipulation (coarsening, tesselation, simplification, import), to be found in its documentation. GTS surfaces are geometrical objects, which can be inserted into simulation as set of particles whose Body.shape is of type Facet – single triangulation elements. pack.gtsSurface2Facets can be used to convert GTS surface triangulation into list of bodies ready to be inserted into simulation via O.bodies.append. make that particle part of a clump and assign mass and inertia of the clump itself (described below). Facets can only (currently) interact with spheres, not with other facets, even if they are dynamic. Collision of 2 facets will not create interaction, therefore no forces on facets. text file in native GTS format. STereoLitography format, in either text or binary form; exported from Blender, but from many CAD systems as well. text file in native format for GMSH, popular open-source meshing program. If you need to manipulate surfaces before creating list of facets, you can study the py/ymport.py file where the import functions are defined. They are rather simple in most cases. The GTS module provides convenient way of creating surface by vertices, edges and triangles. Frequently, though, the surface can be conveniently described as surface between polylines in space. For instance, cylinder is surface between two polygons (closed polylines). The pack.sweptPolylines2gtsSurface offers the functionality of connecting several polylines with triangulation. The implementation of pack.sweptPolylines2gtsSurface is rather simplistic: all polylines must be of the same length, and they are connected with triangles between points following their indices within each polyline (not by distance). On the other hand, points can be co-incident, if the threshold parameter is positive: degenerate triangles with vertices closer that threshold are automatically eliminated. Manipulating lists efficiently (in terms of code length) requires being familiar with list comprehensions in python. Another examples can be found in examples/mill.py (fully parametrized) or examples/funnel.py (with hardcoded numbers). In typical cases, interactions are created during simulations as particles collide. This is done by a Collider detecting approximate contact between particles and then an IGeomFunctor detecting exact collision. Approximate collision detection is adjusted so that approximate contacts are detected also between particles within the interaction radius. This consists in setting value of Bo1_Sphere_Aabb.aabbEnlargeFactor to the interaction radius value. The geometry functor (Ig2) would normally say that “there is no contact” if given 2 spheres that are not in contact. Therefore, the same value as for Bo1_Sphere_Aabb.aabbEnlargeFactor must be given to it (Ig2_Sphere_Sphere_ScGeom.interactionDetectionFactor ). Note that only Sphere + Sphere interactions are supported; there is no parameter analogous to distFactor in Ig2_Facet_Sphere_ScGeom. This is on purpose, since the interaction radius is meaningful in bulk material represented by sphere packing, whereas facets usually represent boundary conditions which should be exempt from this dense interaction network. Run one single step of the simulation so that the initial network is created. Reset interaction radius in both Bo1 and Ig2 functors to their default value again. Continue the simulation; interactions that are already established will not be deleted (the Law2 functor in use permitting). It is possible to create an interaction between a pair of particles independently of collision detection using createInteraction. This function looks for and uses matching Ig2 and Ip2 functors. Interaction will be created regardless of distance between given particles (by passing a special parameter to the Ig2 functor to force creation of the interaction even without any geometrical contact). Appropriate constitutive law should be used to avoid deletion of the interaction at the next simulation step. This method will be rather slow if many interactions are to be created (the functor lookup will be repeated for each of them). In such case, ask on yade-dev@lists.launchpad.net to have the createInteraction function accept list of pairs id’s as well. if it apply force, it should come before NewtonIntegrator, otherwise the force will never be effective. if it makes use of bodies’ positions, it should also come before NewtonIntegrator, otherwise, positions at the next step will be used (this might not be critical in many cases, such as output for visualization with VTKRecorder). When Yade starts, O.engines is filled with a reasonable default list, so that it is not strictly necessary to redefine it when trying simple things. The default scene will handle spheres, boxes, and facets with frictional properties correctly, and adjusts the timestep dynamically. You can find an example in examples/simple-scene/simple-scene-default-engines.py. In the above example, we omited functors, only writing ellipses ... instead. As explained in Dispatchers and functors, there are 4 kinds of functors and associated dispatchers. User can choose which ones to use, though the choice must be consistent. Bo1 functors must be chosen depending on the collider in use; they are given directly to the collider (which internally uses BoundDispatcher). Using more functors than necessary (such as Bo1_Facet_Aabb if there are no facets in the simulation) has no performance penalty. On the other hand, missing functors for existing shapes will cause those bodies to not collider with other bodies (they will freely interpenetrate). SpatialQuickSortCollider is correctness-reference collider operating on Aabb; it is significantly slower than InsertionSortCollider. PersistentTriangulationCollider only works on spheres; it does not use a BoundDispatcher, as it operates on spheres directly. Again, missing combination will cause given shape combinations to freely interpenetrate one another. There are several possible choices of a functor for each pair, hence they cannot be put into InsertionSortCollider by default. A common mistake for bodies going through each other is that the necessary functor was not added. IGeom type accepted by the Law2 functor (below); it is the first part of functor’s name after Law2 (for instance, Law2_ScGeom_CpmPhys_Cpm accepts ScGeom). Unlike with Bo1 and Ig2 functors, unhandled combination of Materials is an error condition signaled by an exception. Law2 functor was the ultimate criterion for the choice of Ig2 and Ip2 functors; there are no restrictions on its choice in itself, as it only applies forces without creating new objects. In most simulations, only one Law2 functor will be in use; it is possible, though, to have several of them, dispatched based on combination of IGeom and IPhys produced previously by Ig2 and Ip2 functors respectively (in turn based on combination of Shapes and Materials). As in the case of Ip2 functors, receiving a combination of IGeom and IPhys which is not handled by any Law2 functor is an error. Many Law2 exist in Yade, and new ones can appear at any time. In some cases different functors are only different implementations of the same contact law (e.g. Law2_ScGeom_FrictPhys_CundallStrack and Law2_L3Geom_FrictPhys_ElPerfPl). Also, sometimes, the peculiarity of one functor may be reproduced as a special case of a more general one. Therefore, for a given constitutive behavior, the user may have the choice between different functors. It is strongly recommended to favor the most used and most validated implementation when facing such choice. A list of available functors classified from mature to unmaintained is updated here to guide this choice. Let us give several examples of the chain of created and accepted types. the Ig2 functors must create ScGeom. If we have for instance spheres and boxes in the simulation, we will need functors accepting Sphere + Sphere and Box + Sphere combinations. We don’t want interactions between boxes themselves (as a matter of fact, there is no such functor anyway). That gives us Ig2_Sphere_Sphere_ScGeom and Ig2_Box_Sphere_ScGeom. the Ip2 functors should create FrictPhys. Looking at InteractionPhysicsFunctors, there is only Ip2_FrictMat_FrictMat_FrictPhys. That obliges us to use FrictMat for particles. In this case, our goal is to use the Law2_ScGeom_CpmPhys_Cpm constitutive law. We use spheres and facets in the simulation, which selects Ig2 functors accepting those types and producing ScGeom: Ig2_Sphere_Sphere_ScGeom and Ig2_Facet_Sphere_ScGeom. We have to use Material which can be used for creating CpmPhys. We find that CpmPhys is only created by Ip2_CpmMat_CpmMat_CpmPhys, which determines the choice of CpmMat for all particles. In most simulations, it is not desired that all particles float freely in space. There are several ways of imposing boundary conditions that block movement of all or some particles with regard to global space. Body.dynamic determines whether a body will be accelerated by NewtonIntegrator; it is mandatory to make it false for bodies with zero mass, where applying non-zero force would result in infinite displacement. Facets are case in the point: facet makes them non-dynamic by default, as they have zero volume and zero mass (this can be changed, by passing dynamic=True to facet or setting Body.dynamic; setting State.mass to a non-zero value must be done as well). The same is true for wall. This way, the force applies for one time step only, and is resetted at the beginning of each step. For this reason, imposing a force at the begining of one step will have no effect at all, since it will be immediatly resetted. The only way is to place a PyRunner inside the simulation loop. The force will persist across iterations, until it is overwritten by another call to O.forces.setPermF(id,f) or erased by O.forces.reset(resetAll=True). The permanent force on a body can be checked with O.forces.permF(id). UniaxialStrainer for applying strain along one axis at constant rate; useful for plotting strain-stress diagrams for uniaxial loading case. See examples/concrete/uniax.py for an example. Engines deriving from FieldApplier are acting on all particles. The one most used is GravityEngine applying uniform acceleration field (GravityEngine is deprecated, use NewtonIntegrator.gravity instead). TranslationEngine and RotationEngine for applying constant speed linear and rotational motion on subscribers. ForceEngine and TorqueEngine applying given values of force/torque on subscribed bodies at every step. StepDisplacer for applying generalized displacement delta at every timestep; designed for precise control of motion when testing constitutive laws on 2 particles. The real value of partial engines is when you need to prescribe a complex type of force or displacement field. For moving a body at constant velocity or for imposing a single force, the methods explained in Imposing motion and forces are much simpler. There are several interpolating engines (InterpolatingDirectedForceEngine for applying force with varying magnitude, InterpolatingHelixEngine for applying spiral displacement with varying angular velocity; see examples/test/helix.py and possibly others); writing a new interpolating engine is rather simple using examples of those that already exist. Engines and functors can define a label attribute. Whenever the O.engines sequence is modified, python variables of those names are created/updated; since it happens in the __builtins__ namespaces, these names are immediately accessible from anywhere. This was used in Creating interactions to change interaction radius in multiple functors at once. Make sure you do not use label that will overwrite (or shadow) an object that you already use under that variable name. Take care not to use syntactically wrong names, such as “er*452” or “my engine”; only variable names permissible in Python can be used. O.tags has some values pre-initialized. Unique identifier of this Yade instance (or of the instance which created a loaded simulation). It is composed of date, time and process number. Useful if you run simulations in parallel and want to avoid overwriting each other’s outputs; embed O.tags['id'] in output filenames (either as directory name, or as part of the file’s name itself) to avoid it. This is explained in Separating output files from jobs in detail. Time when simulation was created (with second resolution). Simulation description and id joined by period (and vice-versa). Description is used in batch jobs; in non-batch jobs, these tags are identical to id. You can add your own tags by simply assigning value, with the restriction that the left-hand side object must be a string and must not contain =. Python variable lifetime is limited; in particular, if you save simulation, variables will be lost after reloading. Yade provides limited support for data persistence for this reason (internally, it uses special values of O.tags). The functions in question are saveVars and loadVars. Only types that can be pickled can be passed to saveVars. A special engine PyRunner can be used to periodically call python code, specified via the command parameter. Periodicity can be controlled by specifying computation time (realPeriod), virutal time (virtPeriod) or iteration number (iterPeriod). More useful examples will be given below. The plot module provides simple interface and storage for tracking various data. Although originally conceived for plotting only, it is widely used for tracking variables in general. The data are in plot.data dictionary, which maps variable names to list of their values; the plot.addData function is used to add them. New record is added to all columns at every time plot.addData is called; this assures that lines in different columns always match. The special value nan or NaN (Not a Number) is inserted to mark the record invalid. It is not possible to have two columns with the same name, since data are stored as a dictionary. An exception are columns having leading of trailing whitespaces. They are handled specially in plot.plots and should not be used (see below). In that case, naturally, the labeled object must define attributes which are used (UniaxialStrainer.strain and UniaxialStrainer.avgStress in this case). Above, we explained how to track variables by storing them using plot.addData. These data can be readily used for plotting. Yade provides a simple, quick to use, plotting in the plot module. Naturally, since direct access to underlying data is possible via plot.data, these data can be processed in any way. Actual plot using data in plot.data and plot specification of plot.plots can be triggered by invoking the plot.plot function. plot.live - By setting yade.plot.live=True you can watch the plot being updated while the calculations run. Set to False otherwise. plot.liveInterval - This is the interval in seconds between the plot updates. 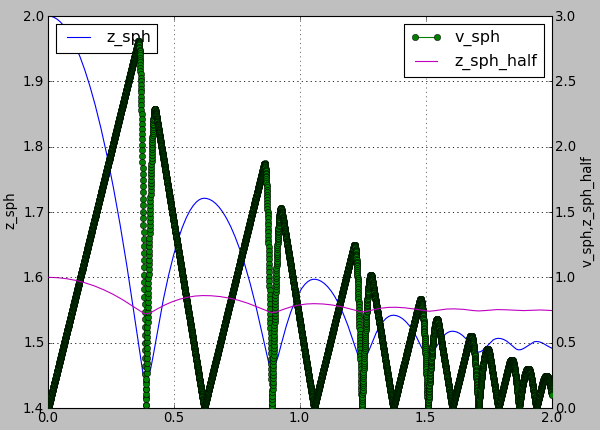 plot.autozoom - When set to True the plot will be automatically rezoomed. 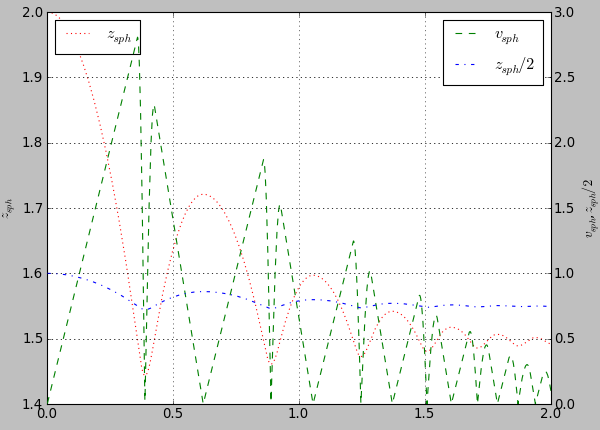 Figure generated by changing parameters to plot.plots as above. Please note that there is an extra , in 'i':(('t','xr:'),), otherwise the 'xr:' wouldn’t be recognized as a line style parameter, but would be treated as an extra data to plot. Figure generated by examples/simple-scene/simple-scene-plot.py, with TeX labels. 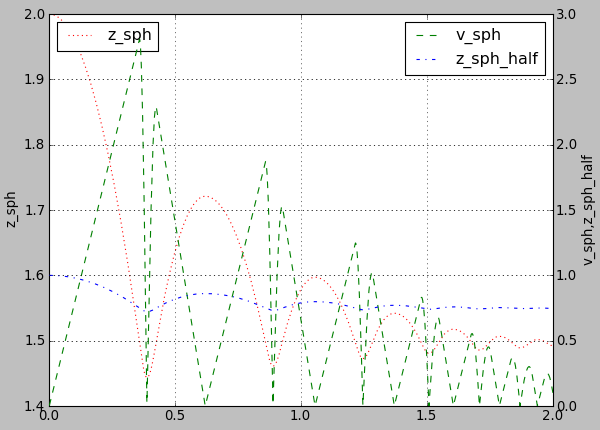 Plots can be exported to external files for later post-processing via that plot.saveGnuplot function. Note that all data you added via plot.addData is saved - even data that you don’t plot live during simulation. By editing the generated .gnuplot file you can plot any of the added Data afterwards. Data file is saved (compressed using bzip2) separately from the gnuplot file, so any other programs can be used to process them. In particular, the numpy.genfromtxt (documented here) can be useful to import those data back to python; the decompression happens automatically. 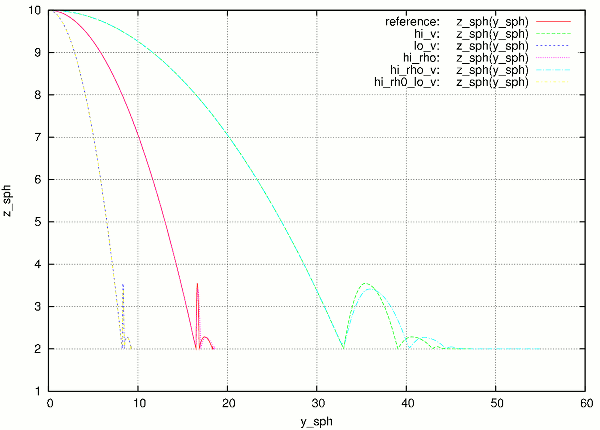 The gnuplot file can be run through gnuplot to produce the figure; see plot.saveGnuplot documentation for details. causes the simulation to run 35466 iterations, then stopping. Frequently, decisions have to be made based on evolution of the simulation itself, which is not yet known. In such case, a function checking some specific condition is called periodically; if the condition is satisfied, O.pause or other functions can be called to stop the stimulation. See documentation for Omega.run, Omega.pause, Omega.step, Omega.stopAtIter for details. Occasionally, it is useful to revert to simulation at some past point and continue from it with different parameters. For instance, tension/compression test will use the same initial state but load it in 2 different directions. Two functions, Omega.saveTmp and Omega.loadTmp are provided for this purpose; memory is used as storage medium, which means that saving is faster, and also that the simulation will disappear when Yade finishes. O.loadTmp cannot be called from inside an engine, since before loading a simulation, the old one must finish the current iteration; it would lead to deadlock, since O.loadTmp would wait for the current iteration to finish, while the current iteration would be blocked on O.loadTmp. They inform about 2 ports on which connection of 2 different kind is accepted. TCP python prompt is telnet server with authenticated connection, providing full python command-line. It listens on port 9000, or higher if already occupied (by another yade instance, for example). The new python interpreter (>>>) lives in a namespace separate from Yade : command-line. For your convenience, from yade import * is run in the new python instance first, but local and global variables are not accessible (only builtins are). The (fake) >>> interpreter does not have rich interactive feature of IPython, which handles the usual command-line Yade :; therefore, you will have no command history, ? help and so on. By giving access to python interpreter, full control of the system (including reading user’s files) is possible. For this reason, connection is only allowed from localhost, not over network remotely. Of course you can log into the system via SSH over network to get remote access. Authentication cookie is trivial to crack via bruteforce attack. Although the listener stalls for 5 seconds after every failed login attempt (and disconnects), the cookie could be guessed by trial-and-error during very long simulations on a shared computer. TCP Info provider listens at port 21000 (or higher) and returns some basic information about current simulation upon connection; the connection terminates immediately afterwards. The information is python dictionary represented as string (serialized) using standard pickle module. This functionality is used by the batch system (described below) to be informed about individual simulation progress and estimated times. If you want to access this information yourself, you can study core/main/yade-batch.in for details. regular Yade script, which calls readParamsFromTable to obtain parameters from parameter table. In order to make the script runnable outside the batch, readParamsFromTable takes default values of parameters, which might be overridden from the parameter table. readParamsFromTable knows which parameter file and which line to read by inspecting the PARAM_TABLE environment variable, set by the batch system. simple text file, each line representing one parameter set. This file is read by readParamsFromTable (using TableParamReader class), called from simulation script, as explained above. For better reading of the text file you can make use of tabulators, these will be ignored by readParamsFromTable. Parameters are not restricted to numerical values. You can also make use of strings by "quoting" them (' ' may also be used instead of " "). This can be useful for nominal parameters. 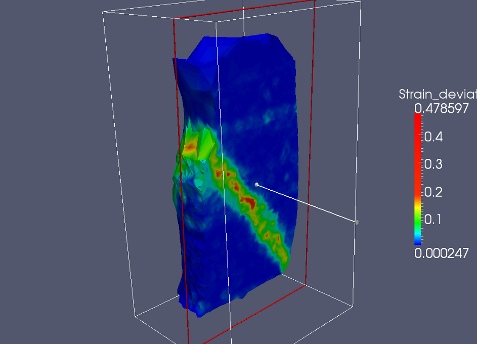 and it will intelligently run one simulation for each parameter table line. A minimal example is found in examples/test/batch/params.table and examples/test/batch/sim.py, another example follows. 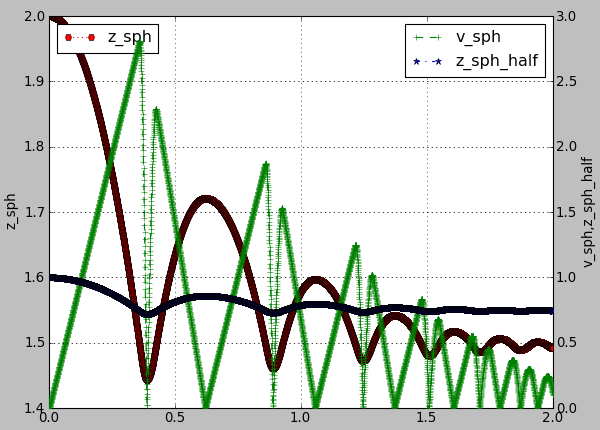 Each line give one combination of these 2 parameters and assigns (which is optional) a description of this simulation. after the call to readParamsFromTable, corresponding python variables are created in the yade.params.table module and can be readily used in the script, e.g. Will run `/usr/local/bin/yade-trunk' on `batch.py' with nice value 10, output redirected to `batch. @.log', 4 jobs at a time. Will use table `batch.table', with available lines 2, 3, 4, 5, 6, 7. Will use lines  2 (reference), 3 (hi_v), 4 (lo_v), 5 (hi_rho), 6 (hi_rho_v), 7 (hi_rh0_lo_v). These lines inform us about general batch information: nice level, log file names, how many cores will be used (4); table name, and line numbers that contain parameters; finally, which lines will be used; master PID is useful for killing (stopping) the whole batch with the kill command. displays all jobs with command-lines that will be run for each of them. At this moment, the batch starts to be run. As one might output data to external files during simulation (using classes such as VTKRecorder), it is important to name files in such way that they are not overwritten by next (or concurrent) job in the same batch. A special tag O.tags['id'] is provided for such purposes: it is comprised of date, time and PID, which makes it always unique (e.g. 20100413T144723p7625); additional advantage is that alphabetical order of the id tag is also chronological. To add the used parameter set or the description of the job, if set, you could add O.tags[‘params’] to the filename. Default total number of available cores is determined from /proc/cpuinfo (provided by Linux kernel); in addition, if OMP_NUM_THREADS environment variable is set, minimum of these two is taken. The -j/--jobs option can be used to override this number. By default, each job uses all available cores for itself, which causes jobs to be effectively run in parallel. Number of cores per job can be globally changed via the --job-threads option. Table column named !OMP_NUM_THREADS (! prepended to column generally means to assign environment variable, rather than python variable) controls number of threads for each job separately, if it exists. If number of cores for a job exceeds total number of cores, warning is issued and only the total number of cores is used instead. to the output (redirected to log file). Figure from single job in the batch. At the end, the batch system knows about all gnuplot files and tries to merge them together, by assembling the merged.gnuplot file. Merged figure from all jobs in the batch. Note that labels are prepended by job description to make lines distinguishable. While job is running, the batch system presents progress via simple HTTP server running at port 9080, which can be acessed from regular web browser by requesting the http://localhost:9080 URL. This page can be accessed remotely over network as well. Summary page available at port 9080 as batch is processed (updates every 5 seconds automatically). Possible job statuses are pending, running, done, failed. and it will generate one launch script and submit one job for each parameter table line. A minimal example is found in examples/oar/params.table examples/oar/job.sh and examples/oar/sim.py. yade-oar is not compiled by default. Use -DENABLE_OAR=1 option to cmake to enable it. Capture screen output (the 3d rendering window) during the simulation − there are tools available for that (such as Istanbul or RecordMyDesktop, which are also packaged for most Linux distributions). The output is “what you see is what you get”, with all the advantages and disadvantages. The video is encoded using the default mencoder codec (mpeg4). Specialized post-processing tools, notably Paraview. This is described in more detail in the following section. iterPeriod determines how often to save simulation data (besides iterPeriod, you can also use virtPeriod or realPeriod). If the period is too high (and data are saved only few times), the video will have few frames. fileName is the prefix for files being saved. In this case, output files will be named /tmp/p1-spheres.0.vtu and /tmp/p1-facets.0.vtu, where the number is the number of iteration; many files are created, putting them in a separate directory is advisable. export.VTKExporter plays a similar role, with the difference that it is more flexible. It will save any user defined variable associated to the bodies. After clicking “Apply”, spheres will appear. They will be rendered over the original white points, which you can disable by clicking on the eye icon next to p1-spheres. * in the Pipeline browser. Another opportunity to display spheres is by using PointSprite plugin. This technique requires much less RAM in comparison to Glyphs. If you want to make facet objects transparent, select p1-facets. 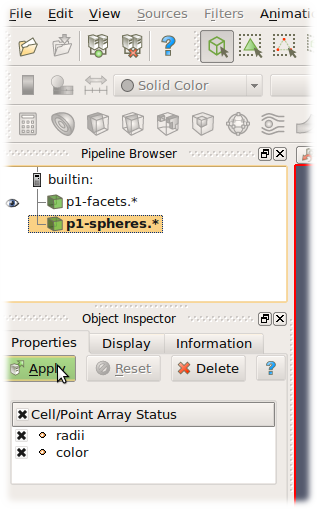 * in the Pipeline browser, then go to the Object inspector on the Display tab. Under “Style”, you can set the “Opacity” value to something smaller than 1. You can move between frames (snapshots that were saved) via the “Animation” menu. After setting the view angle, zoom etc to your satisfaction, the animation can be saved with File/Save animation. It is sometimes useful to visualize a DEM simulation through equivalent strain fields or stress fields. This is possible with TesselationWrapper. This class handles the triangulation of spheres in a scene, build tesselation on request, and give access to computed quantities: volume, porosity and local deformation for each sphere. The definition of microstrain and microstress is at the scale of particle-centered subdomains shown below, as explained in [Catalano2014a] . As any other value, the stress can be exported to a vtk file for display in Paraview using export.VTKExporter. problem with graphics card driver. If you think this might be error in Yade, file a bug report as explained below. Do not forget to attach full yade output from terminal, including startup messages and debugger output – select with right mouse button, with middle button paste the bugreport to a file and attach it. Attach your simulation script as well. Bugs are general name for defects (functionality shortcomings, misdocumentation, crashes) or feature requests. They are tracked at https://gitlab.com/yade-dev/trunk/issues. When reporting a new bug, be as specific as possible; state version of yade you use, system version and so on, as explained in the above section on crashes. Please use Launchpad interface at https://answers.launchpad.net/yade/ for asking questions about Yade. In case you’re not familiar with computer oriented discussion lists, please read this wiki page (a Yade-oriented and shortened version of How To Ask Questions The Smart Way) before posting, in order to increase your chances getting help. Do not forget to state what version of Yade you use (shown when you start Yade), whether you installed it from source code or a package, what operating system (such as Ubuntu 18.04), and if you have done any local modifications to source code in case of compiled version. In addition to the Q&A Launchpad interface, Yade has two mailing-lists. Both are hosted at http://www.launchpad.net and before posting, you must register to Launchpad and subscribe to the list by adding yourself to “team” of the same name running the list. You might contact developers by their private mail (rather than by mailing list) if you do not want to disclose details on the mailing list. This is also a suitable method for proposing financial reward for implementation of a substantial feature that is not yet in Yade – typically, though, we will request this feature to be part of the public codebase once completed, so that the rest of the community can benefit from it as well. © Copyright 2009, Václav Šmilauer. Created using Sphinx 1.4.9.